Madarao Kogen Ski Resort (斑尾高原スキー場 or a.k.a. 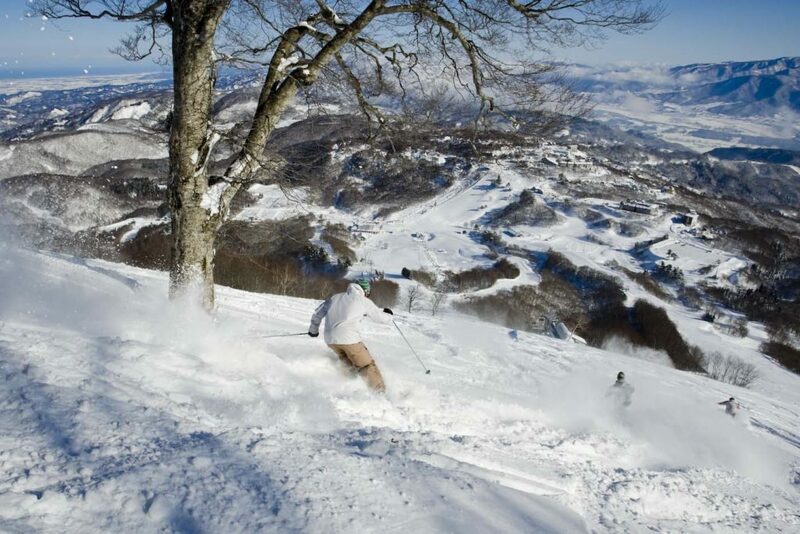 Madarao Mountain Resort) is a unique bowl shape resort with 22 separate courses best suited to intermediate skiers and snowboarders, but there is some terrain for beginners and some fairly steep runs for advanced skiers and snowboarders. There’s a lot to see and do on the mountain, but you’ll easily be able to explore all it’s runs in a full day. Despite typical Japanese lift infrastructure geared to on-piste skiers accessing the lower slopes, you can still access most areas without too much traversing and upload reasonably efficiently. 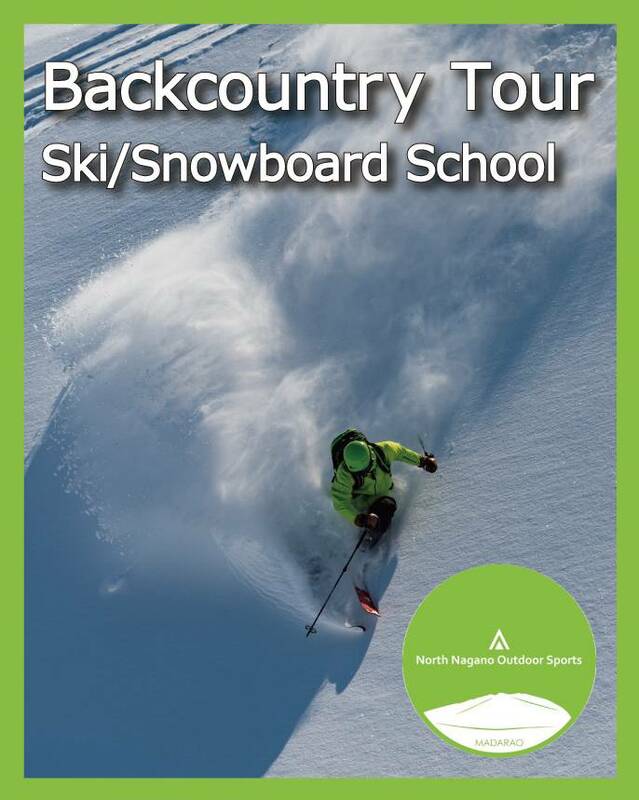 There are English-language Madarao ski school lessons available as well as Madarao backcountry tours. Mt. Madarao reaches a height of 1,382 meters tall and has 16 lifts, all of which are free for overseas children 12 and under. The common consensus is that this resort is usually uncrowded during weekdays with a good selection of runs, some nicely groomed trails (although 60% of the courses are ungroomed), and there are also very impressive views of Mt Myoko on a clear day. 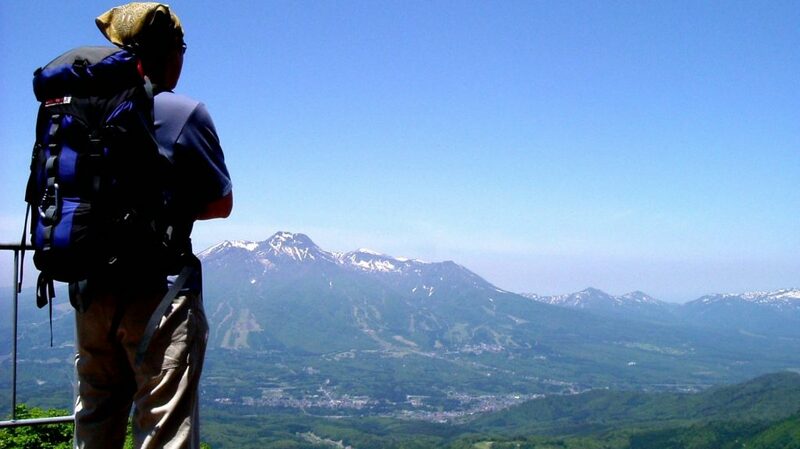 Madarao Kogen Ski Resort is quite near to Nagano City as well as the resorts in Myoko and Nozawa Onsen. Madarao-Kogen is connected to Tangram Ski Circus Resort at the top of the mountain and a joint ticket is available to let you ski or snowboard both. For those wanting to step outside the resort, backcountry access is available through the top gate. There are also plenty of options to ski back into the resort for lift-accessed sidecountry fun and backcountry ski tours in Madarao Kogen are available. Lift and food prices are reasonable, plus there are discounts for seniors over 58 yrs old. Like many Japanese resorts, Madarao offers night skiing on weekends. They also host New Year’s Eve nightskiing and fireworks, and a Dondoyaki Fire Festival in early January. See our Events page for more info on these. There are various food options on the mountain including a large cafeteria offering moderately-priced food from ramen to hotdogs and tap beer, a convenience store and several small eateries. 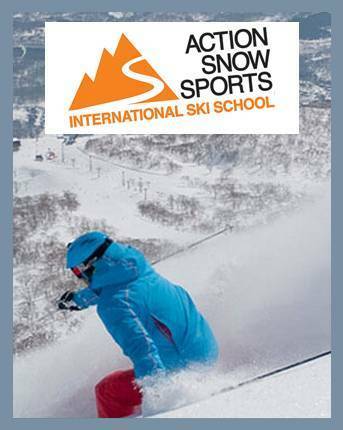 There are English-language Madarao ski school lessons available at North Nagano Outdoor Sports, Madarao Sports Academy and Action Snow Sports. Additionally Madarao back country and ski guiding tours are available. For your Madarao ski rental needs there are three ski shops + various accommodation providers also have ski rental onsite. 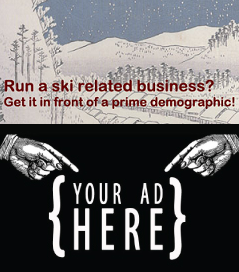 See more information and request your Madarao ski school lessons and Madarao Ski Rental here! For anyone wanting to ski with young families, there is also childcare and a kids park available. Next to the kids park, Restaurant Tyrol has a kids room and other child services available. Tangram Lifts are not included on this pass. Customers who plan on using the Tangram lifts should purchase the Mountain Pass. （Cannot be used during “Nighter” hours）. There is a great variety of Madarao accommodation from Annex Aburaya right by the ski lifts, or cosy lodges such as Fujio Pension and Alp Bach Madarao. See more Madarao hotels and accommodation here. 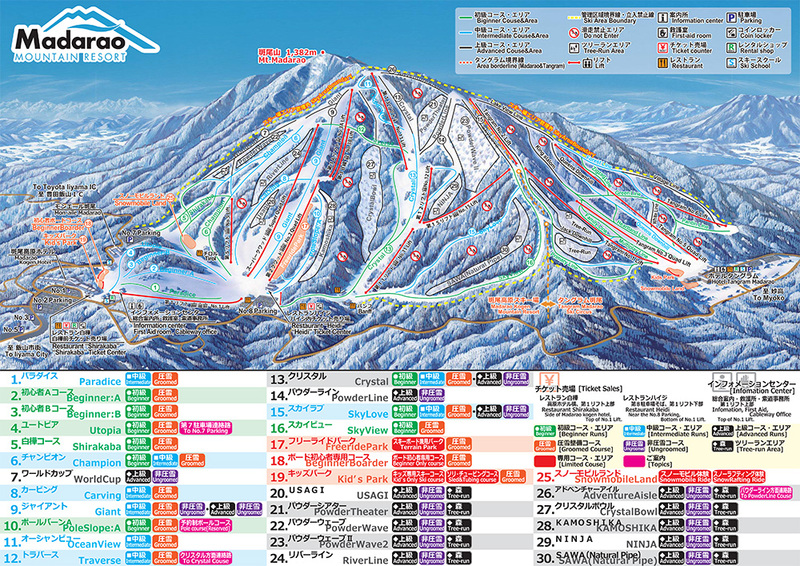 Madarao Kogen Hotel offers ski-out convenience, being situated right at the top of the Madarao Kogen ski lifts. The hotel offers a beautiful view of the Madarao Plateau plus an onsen onsite. The restaurant serves authentic Italian dishes, Japanese cuisine made with ingredients freshly plucked from the Sea of Japan, or Chinese dishes. 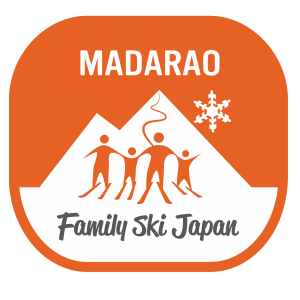 Madarao Kogen Hotel is family friendly with English speaking concierge and handily located close to ski rentals, restaurants, etc. Packages with ticket available – contact us for more details and/or a quote. 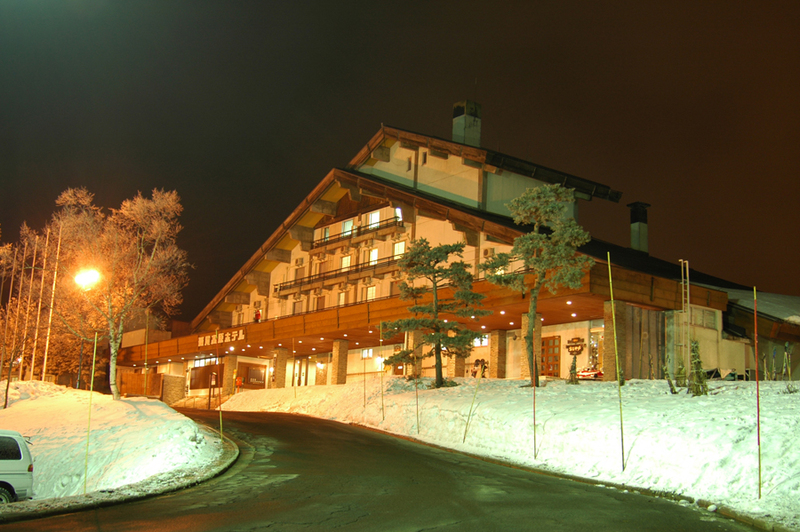 See more info on this Madarao hotel or check Madarao Kogen Hotel vacancies online now! Train: Twenty five minutes from Myokokogen Station on the Kita-Shinano line, or fifteen minutes from JR Iiyama Station (Shinkansen stop). Need a car? Madarao car rentals. Pick up at Iiyama Station.